The worlds of Jeremy Saulnier are dark and deadly, but ultimately, like any vampire�s castle, too alluring to miss out on. Even as the protagonist enters into the creaking halls of that place of horror, we know they�re as good as dead (or most of them, at least). In Blue Ruin, a lost man embarks on a doomed quest. In Green Room, a punk-rock band goes to a gig they should have turned down. 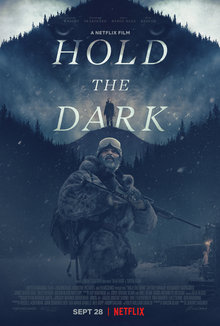 In Hold the Dark, an expert on wolf behavior sets off to an isolated village in Alaska to find the remains of a boy taken by the same creatures. There is nothing to find in the film, like in the previous ones, expect pitch black desperation, cruelty and an unmissable sense of nothingness. Yet, the ride itself is still what allows us to usher them on, into the twilight. Here too, the experience of the movie and the twist and turns its plot embarks upon so elegantly and completely unexpectedly, make it a worthwhile experience. It is reassuring to see that the creative universe of Saulnier is completely inoculated from the spellbound power of bigger and bigger budgets. Hold the Dark has a lot to offer even though what that thing exactly is remains lost to me.